Consider that a wave of dismissal to her spot on DWTS, as the very rich beyotch was eliminated from the competition this week. Watch her final dance. 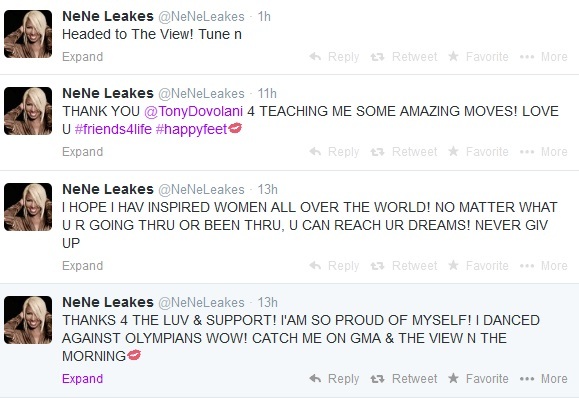 She then took to twitter to share some words of encouragement (and promo) with followers. I wonder what Lenethia is gonna go home and do now. I mean, she turns down scripts all the time. Where will we see her next? What are your thoughts on NeNe’s Dancing With the Stars run? Did she deserve to go home? Give us the tea in the comments section!